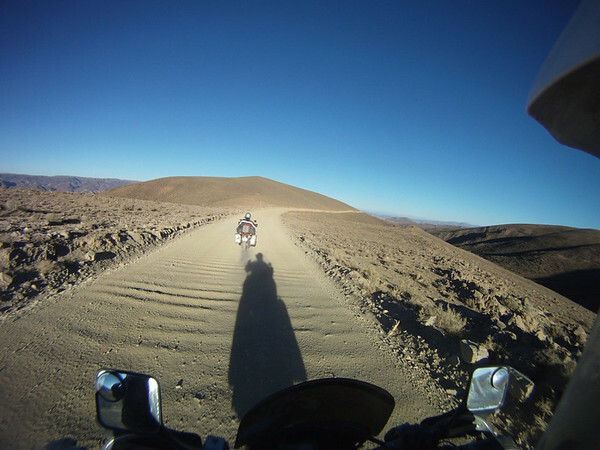 Our decision to go to Uyuni meant that our route was decided for us- along a 200 kilometer dirt road that stretched its way along altiplano south to Tupiza in the direction of the Argentinian border. 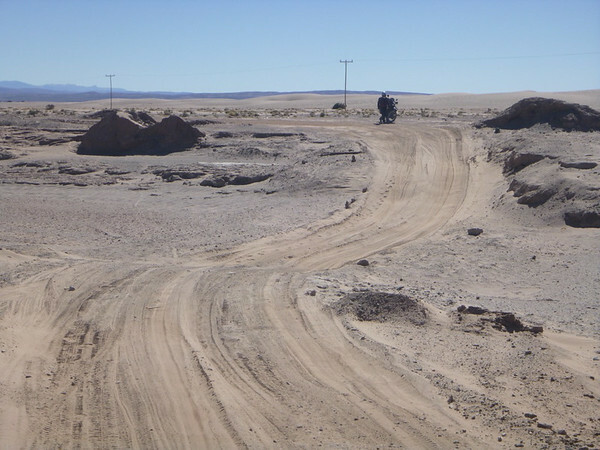 There is a paved road that goes south to Argentina but it’s inaccessible from Uyuni and one would have to drive north to Potosí (where we have been twice already during our trip) then start heading south. 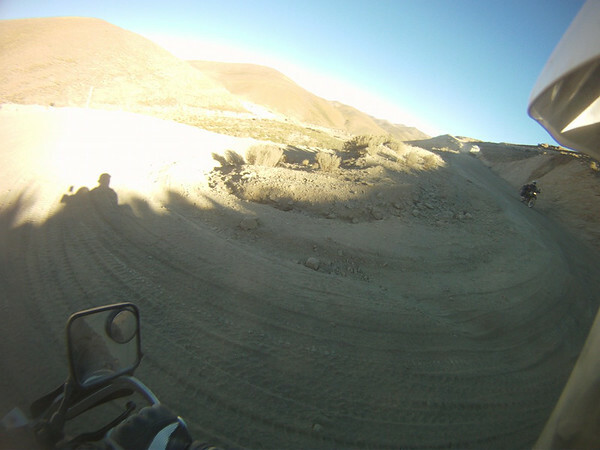 Since we didn’t want to ride all the way back to Potosí, we decided to take the dirt road. After all, it was only two hundred kilometers. How long could it really take? 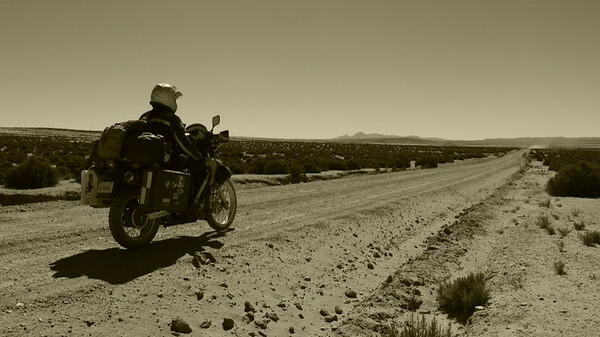 Various reports from other riders who had recently ridden the road told us that we could expect it to take anywhere from seven to ten hours to traverse the entire length. Even Google maps wasn’t on our side when it reported seven and a half hours. 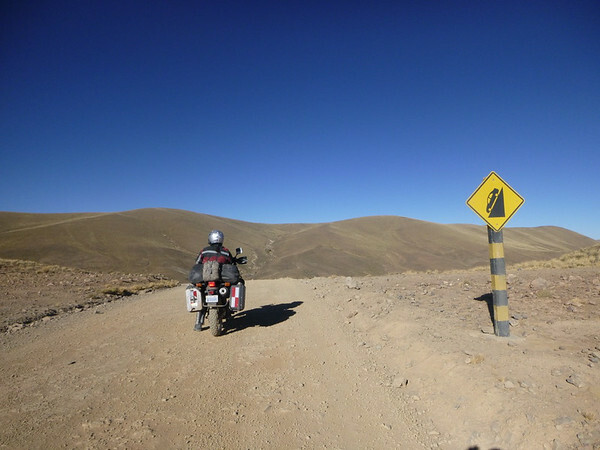 In comparison, driving all the way back up to Potosí, then down past Uyuni to Tupiza on the paved road would only take six hours. 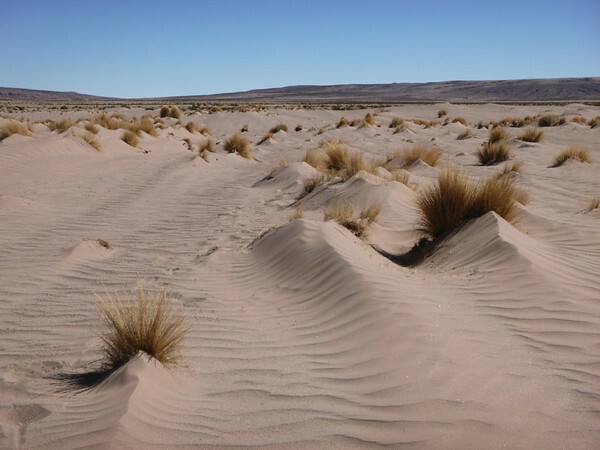 It was also said that the road was in pretty bad condition with drifting sand and rough corrugation. As I am not the biggest off-roading fan (even though technically this was a road), this didn’t sound like too much of a promising day for me. Adam, on the other hand, was stoked. He had ridden this road four years ago and really enjoyed it, so couldn’t wait to show me. On the day of departure we were up bright and early, had a hearty breakfast, packed up the bikes, and headed out along the road. 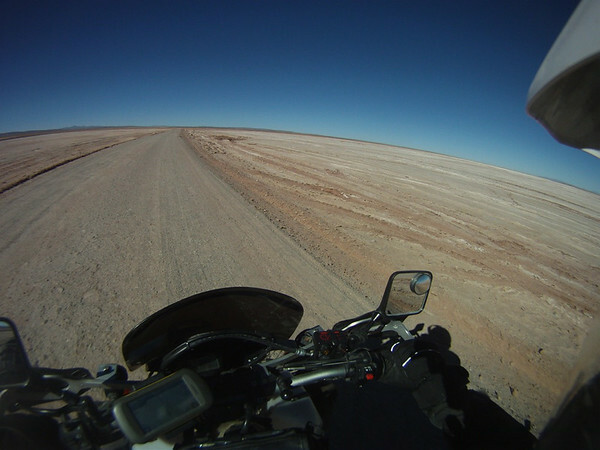 From the very first moment we left Uyuni, there was no pavement to be seen. 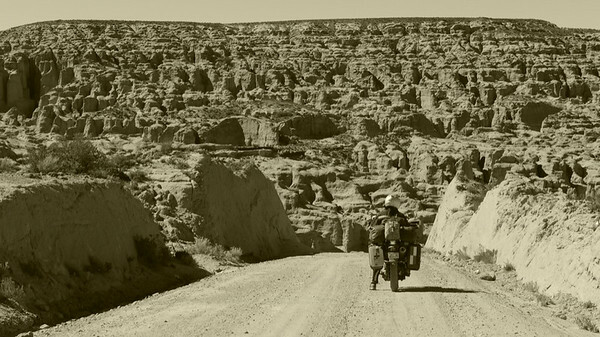 The road was dirt, covered in loose gravel and stretched off straight, straight, straight, as far as the eye could see. The tires slipping around as they tried to find traction was a bit unnerving but I tried to recall what I had learned from Clinton’s off-roading school, all those years ago. I knew that it was normal for the bike to slide around a bit as it searched for grip on the road, so I accepted the squirly feeling as normal and we proceeded on. Skirting around some icy patches. 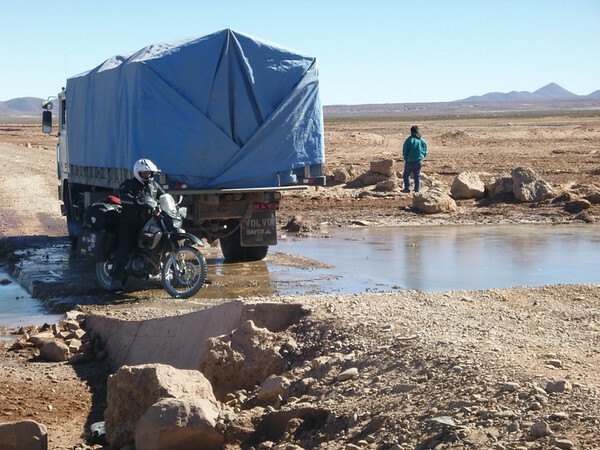 Not too long into our journey, we came across our first water crossing where a truck had become stuck. At first it was a little unclear as to why the truck couldn’t cross, as there was a paved section through the river. Upon further inspection, we discovered that the concrete was covered in ice and the truck was most likely unable to get any traction. We waited a few minutes to see if the driver was going to attempt to finish the crossing before Adam rode both bikes past the truck on a narrow bit of the concrete, which was also covered in ice, and we were back on our way. This was good news as Adam was growing tired of Señor boozy breath, a pissed drunk passer by who had been pestering him, and “urging him on”, on slurry like. The scenery all around us was pretty amazing. 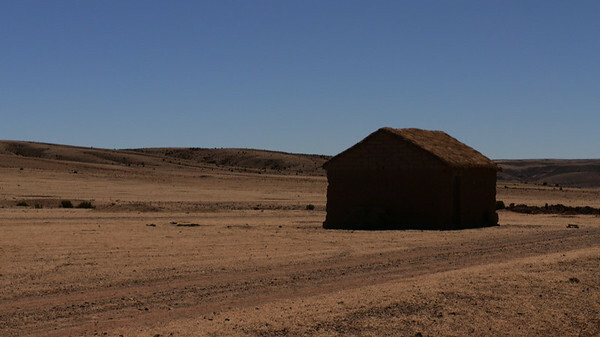 Large, flat areas of nothing extending as far as the eye could see. 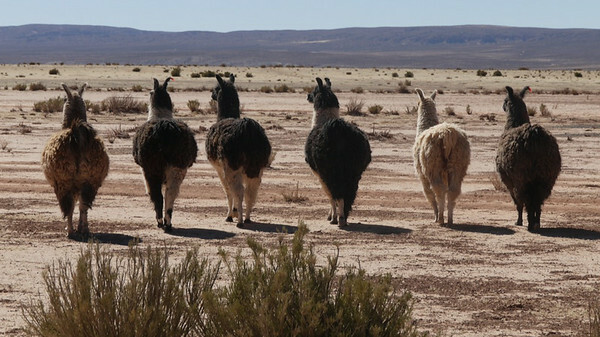 We passed by numerous herds of llama wandering across the road way with seemingly little fear of humans, as they didn’t scatter like previous herds when we approached. The colours of the land were pretty cool too, as the sand changed from grey to red to beige and back again. There were even spots of green. Hills began to show and those same colours were reflected there too, like a painter’s palette. 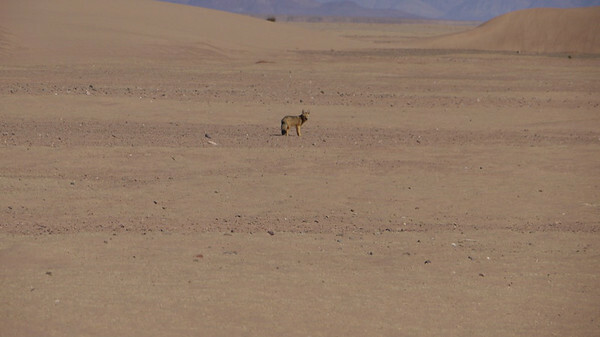 We also saw an Andean fox that was very dog-like in its movements and colours (German Shepherd like), but with a huge bushy tail. There was a bit of excitement when Adam’s right pannier fell clean off of his bike. 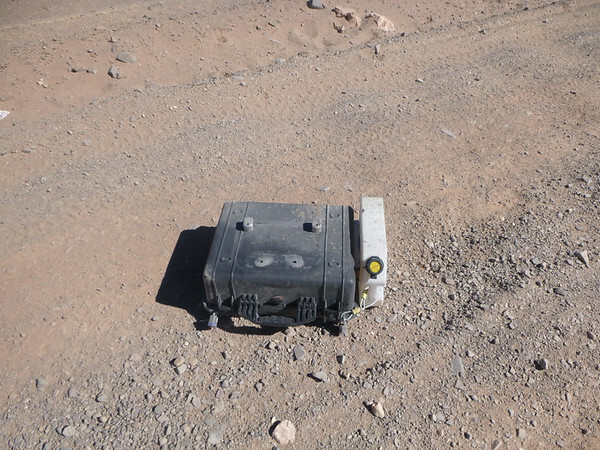 The harsh vibrations of the road were enough to loosen up both of the screw-in handles, thus shaking the pannier completely free of the rack, leaving it lying in a trail of dust. It was a bit surprising since we decided to use a bit of Lock-Tight on the screws in anticipation of this very thing. Adam circled back and picked up the pannier and re-affixed it to the bike, where it stayed for the rest of the ride. So much for Lock-Tite. Hmmm. Surely I musn’t have tightened it enough. A few hours into the ride we reached a dune area where a sign warned us that there would be sand on the road for the next 100 meters. It soon became apparent that the dunes had taken over the road and where road might have once been were just two tire tracks where other cars had previously gone through. 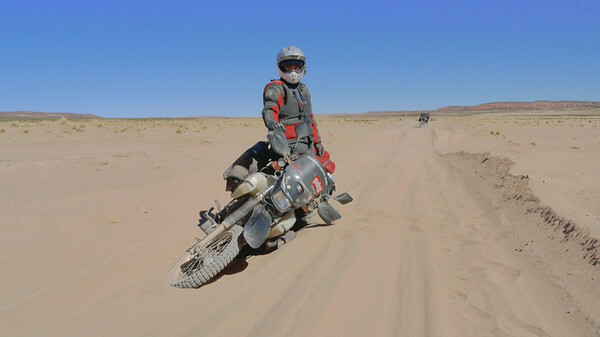 Neither of us had had a lot of experience riding through sand but knew that it involved keeping steady throttle while holding the handlebars straight (or something like that). 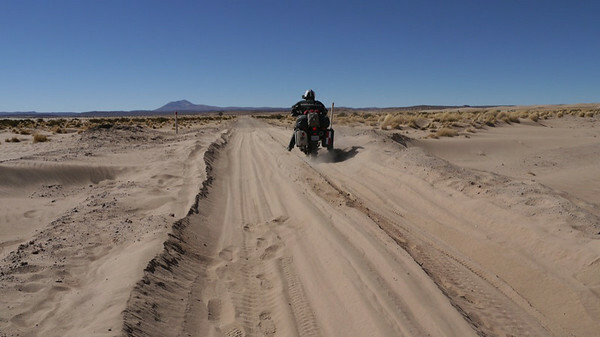 We had already ridden through a few patches of sand, and hadn’t had too many problems, so off we went. Or should I say, off I went? 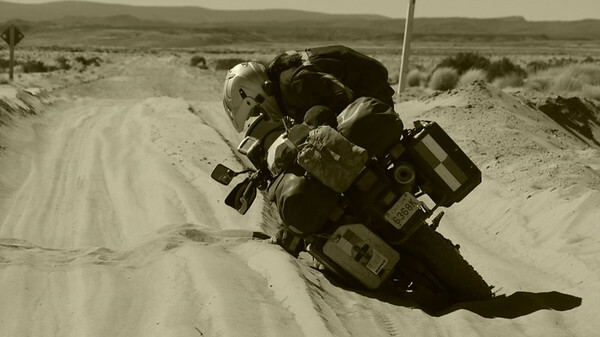 I bravely plowed into the sand and was doing quite well until the track that I was in sunk into a big of an angle and I sunk sideways, dropping the bike and myself onto the ground. The nice thing about falling into the sand at a slow speed, is that the sand was soft and very warm from the hot sun. It would have been nice to have pulled out a book and spent hours lying in it. 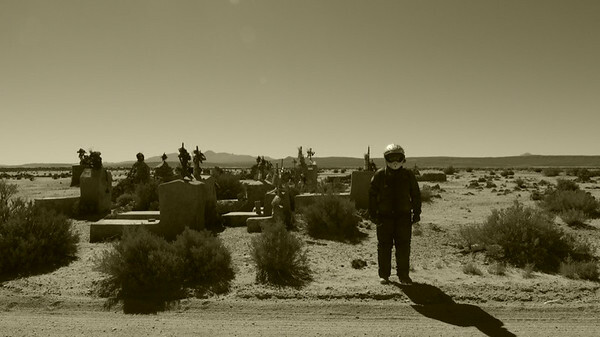 Once Adam had confirmed that I was alright, he pulled out the camera and started taking photos of me standing beside my fallen bike. Isn’t that what a good riding buddy does? Needless to say, the sand didn’t end there. There were a few more deep patches which we made through without incident, but it was hard work. We were both tired and sweaty after paddling our way through the stuff, and were tempted to strip off a few layers but since we were still up at quite an altitude, and both knew that it probably wasn’t wise. We passed through areas with amazing rock formations before heading into the mountains. Mountains? I was not promised mountains. 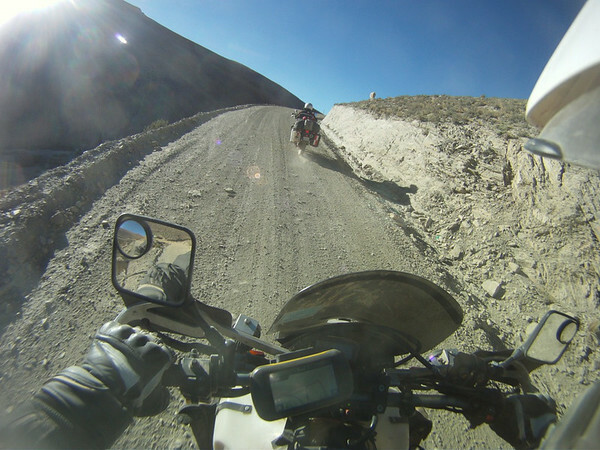 At first, it was like a little game, as I slowly weaved my way down steep grades covered in loose gravel and sand, then up and around ridiculous switchbacks, as we went over high mountain passes. 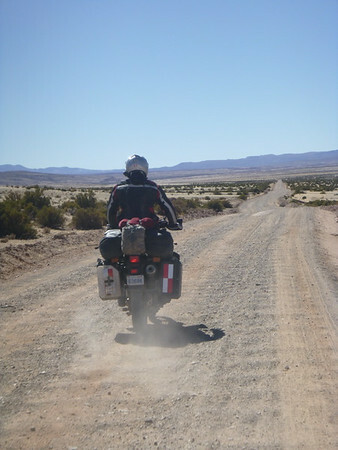 There was very little traffic, which made the riding a little easier, but at hour six, I began to feel very worn-out. 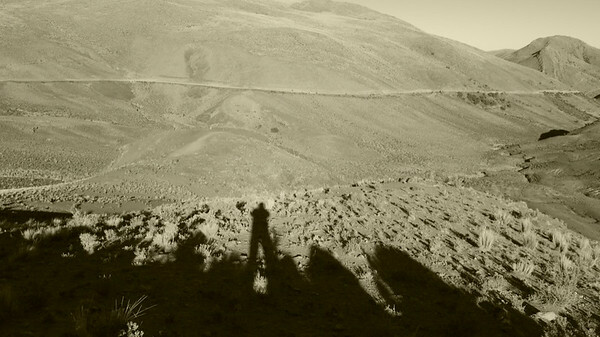 With still many hours left of riding, I was beginning to feel exhausted, and cold as the sun was beginning to set. Just when I thought that I couldn’t go on, we crossed the highest pass and began to descend into a valley. The temperature started to increase. The hills were covered in cactus. It started to look like Arizona. And we went down, down, down into the valley that would eventually lead us to Tupiza. 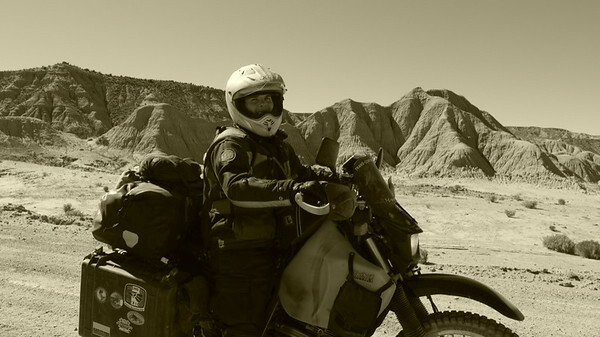 While the road had flattened out, the corrugation kicked into high gear and it seemed like (to borrow a line from Ewan MacGregor in Long Way Down) “we were systematically shaking our bikes to pieces”. 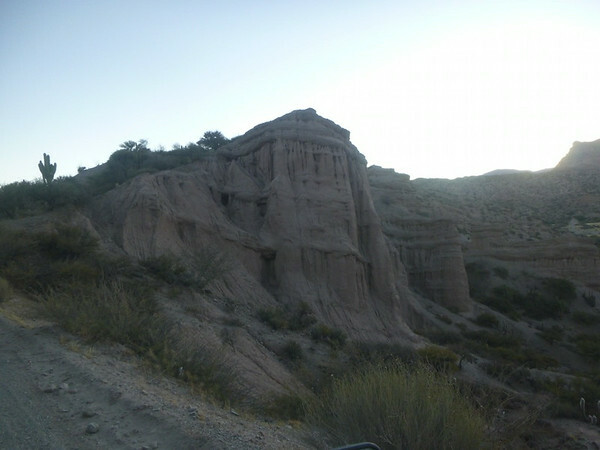 Approximately 20 kilometers outside of our destination, we went through an area known at the Magic Canyon. It was very much like Moab in Utah with giant impressive red rock formations, river canyons, and a dipping and weaving road. It was one of the my most favourite places, to date. Unfortunately, we got there as the sun was setting and wanted to get to Tupiza before it got too dark so we didn’t stop. The road had taken us 8.5 hours to ride. Not terrible but a grueling 8.5 hours it was. I am pretty proud of my accomplishments but would never ride this road again. There were some really great parts including the river crossings, the scenery, and the wildlife, but it was so incredibly exhausting and a test of my endurance. Tupiza shone like a beacon as our first glimpse of the town came into view. We hadn’t done any research as to where to stay in Tupiza so we cruised into town with only Adam’s vague recollection of the town being somewhat “cowboy” with a very John Wayne feeling to it. This turned out to be not accurate at all. Tupiza was more like San Gil, a small town that we had stayed in in Colombia. Cute, quaint, and down to earth. 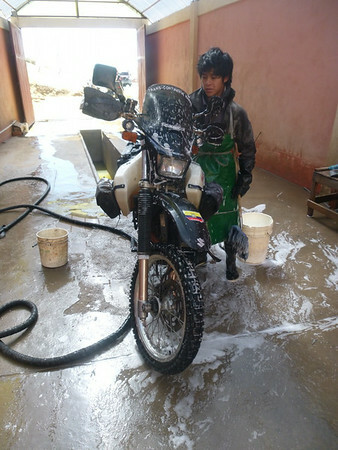 The first hotels that we stopped at were pretty expensive (about $60), but we eventually found one for BS 110 (less than $20) (Hostal Horizonte Colorado) that would allow us to park our bikes in their lobby. The staff promised us wi-fi and hot water in the shower. Bzzzz. That’s one “invigorating” shower. Our room was pretty average and we were unable to connect to the internet at all. There didn’t appear to be working wifi in the hotel. Adam went to complain and the woman at the desk, after trying to connect, as well, told Adam to check again in half an hour. Three hours later there was still no internet. Adam went to complain again, and miraculously, internet appeared. The shower had some real issues. With an “instant heat” sort of shower head, it is sometimes necessary to flip the breaker on prior to use. In this case, turning on the tap, water started to shoot out the top of the shower head complete with sparks as some sort of electrical circuitry in the head popped and fizzled. 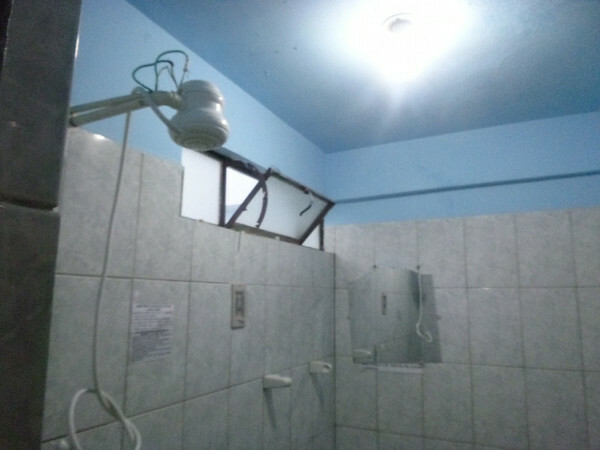 I didn’t think it was the best idea to have a shower in this environment so I carefully reached over to the knob to shut the water off, and got an electrical shock. It was back to the front desk to complain again. This time, they gave us a key to the neighbouring room that had a fully functioning shower, so that we could use that bathroom. After our eventful evening, we were up and on our way after breakfast for the last leg of Bolivia. 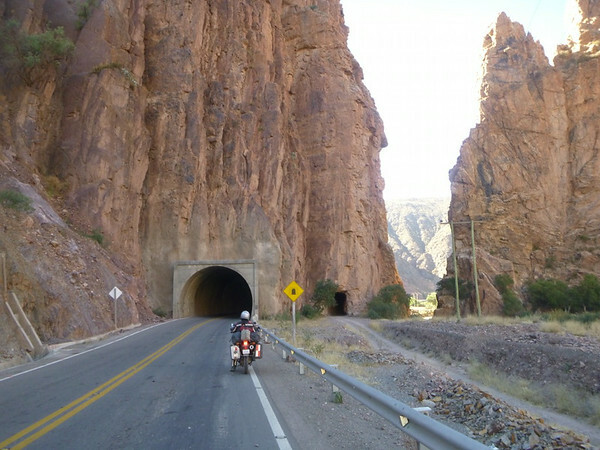 The ride was quite enjoyable, paved, and twisty through a river canyon, over desert hills, and through a mountain tunnel. As we neared the border, though, the temperature started to fall again and soon we had jacked up the heat in our electrically heated jackets. 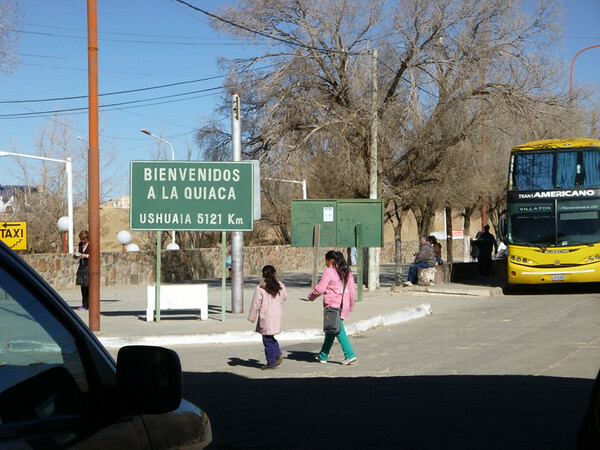 The border crossing into Argentina was one of the worst ones of the entire trip. We had heard that it could take a while to get across (5 hours, on some accounts!) but were pretty optimistic after we received our Bolivia exit stamp and cancelled our vehicle permits within half an hour of our arrival. Our entry stamp into Argentina also didn’t take too long, but the official requested a whole lot of documents, comparatively, asking to see our driver’s licenses, vehicle permits, passports, tourist cards, and reciprocity fee receipts. 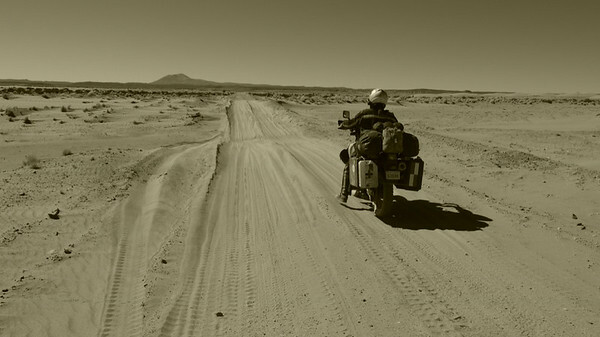 Obtaining the vehicle permit for Argentina was the real pain of the process. We were directed to an office where a number of people were waiting with giant bags of shopping, and large objects that they had purchased on the Bolivia side. After waiting in line for an hour or so, and having asked one official whether we were at the correct office (“sí”), another official then told us that we were waiting in the wrong line and directed to an office across the street. When we went inside, we were ‘greeted’ by a man behind a desk who was reading the newspaper, and who didn’t seem to know what we were talking about when we requested our vehicle permits. So we went back across the street to ask the official which office, again. She escorted us into the same office, where the same man promptly folded up his newspaper and set to work typing up our permits. Soon another official came in with a group of drivers, and started to help the first man with our permits. Once Adam’s permit had been finished we were shuffled to the next desk so that official #2 could use the computer that official #1 had been using. When this happened both official #1 and the female official left the office, leaving us with one permit for one bike with many typos. After about half an hour of standing there, official #2 asked us what else we needed to which we replied that we still needed the permit for my bike and that the permit for Adam’s bike was incorrect. He didn’t really seem to care, and eventually the female official returned to complete the process, with three more corrections to Adam’s permit. She then instructed us to move the bikes near to the aduana (customs) tables, so that the bikes could be examined (i.e. searched) before proceeding into Argentina. I wasn’t surprised that this was going to happen but was growing a little impatient by this point after all the waiting. I was already convinced that the people in the office couldn’t actually read. Or type. Or understand a spoken language. And now we had to wait for our bikes to be searched. And wait we did. As I said, I wasn’t too surprised that they wanted to search the bikes, since there was a steady stream of cross-border shoppers coming from Bolivia with large bundle bags of goods, and the Argentinian government wasn’t going to miss out on taxes on so much missed out consumerism. So we waited. And waited. And waited. Female official was nowhere to be seen. We went back into both offices to find out where she went, and still couldn’t find her. After what seemed like hours, I went to another official to ask what was happening, if they needed to search the bikes, and if we could go. I must have been pretty frazzled and scary, because he seemed a little shocked that we were still there, and told us that we could go. As we were gearing up and getting on the bikes, a police officer approached us to ask if we had been searched by aduana, and in my impatient Spanish I told her where to go. No, not really. But at this point, I would have loved to. I pointed in the general direction of aduana and tried to say that we were told to go. She didn’t believe me, and went off to find the agent. Luckily he confirmed and we were on our way. After four hours. Four hours at the border. Four hours mostly waiting on the whims of border officials who certainly didn’t seem to busy processing other people. One of the longest and most complicated crossings yet.